I wish it had my name on it, that's large for Illinois. That is large for anywhere. That it came from Illinois is no real surprise. A genuine beast that many may pick apart or disparage but that is a once in a thousand year buck. 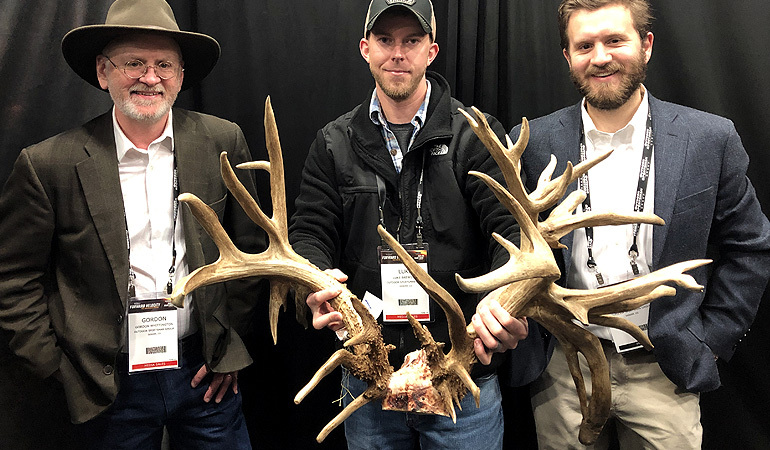 first day of the 2019 ATA Show in Louisville, Ky.
With a net score of 320 5/8 inches, the Brewster Buck is the largest archery non-typical of all-time as well as the largest hunter-killed whitetail of all-time. Way cool good news. Congrats to the bowhunter. Thx for posting. Stud. The deer and the hunter. Dang! Looks like he slept on his left side and it took root. I’m glad old records can be broken. Biggest deer EVER. That’s cool and with a bow!!! That is just crazy! Very unique in only one side having the most deformities. Free range deer? If so...wow,just wow! Not sure I could hold it together & put a good shot on something like that with a bow! Would have been a good un next year. Kinda weak on his right side. Magnificent, and I don't even use the word magnificent. What an amazing deer, and a truly remarkable thing to happen to a hunter. Congratulations to Mr. Brewster. His feat is legendary. how in the world do you keep calm enough to shoot a deer like that, my arrow would have rattled out of the rest! You can't kill big deer with a bow!